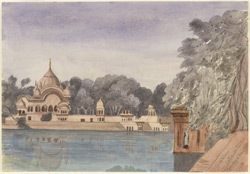 Water-colour sketch of the Tomb of Surujmal at Govardhan, Uttar Pradesh by Stanley Leighton (1837-1901), 6 December 1868. Inscribed on the mount in pencil is: 'Goverdhun nr Muttra. The Tomb of Soorujmull. Sunday. 6 Dec. 1868.' Govardhan is situated near to Mathura in Uttar Pradesh on a narrow sandstone hill known as Giriraj which is about 8 km in length. The Mansi Ganga, a large masonry tank, is a prominent feature of the town and is flanked by temples and the cenotaphs of members of the royal family of Bharatpur. The interior of the tomb of Raja Surajmal (1707-1763) exhibits fine frescoes which portray the life of Surajmal, including darbars, hunting scenes, royal processions and military campaigns.